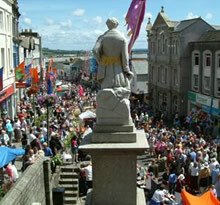 The Golowan festival (Cornish for midsummer) is the festival of St. John and is held in Penzance each year in late June. Although it is an old tradition, it was revived by a group of artists and local schools in 1991 in order to remember the local area heritage. The festival is ten days long, culminating in the Mazey weekend and notably Mazey Day on the Saturday. Golowan was one of the last mid summer festivals practiced in Cornwall. In the 1890’s, the Penzance government outlawed the festival due to the rising insurance premiums for the towns business community. Traditionally the towns streets were lined with alight tar barrels which were paraded around. The surrounding hills had bonfires set at the top, throwing dancing shadows all around mounts bay and beyond. Read more about the Golowan Festival on West Cornwall Events. The festival this year is between 18th June to 26th June. Penglaz, the Penzance obby oss is set loose around the quay area, leading a procession of dancers and musicians. There is a fair held next to jubilee pool and there is many music events in the surrounding area, including a large music tent at the quay. Mazey Day centres around the parades and other street events in the centre of town. Stalls and musical events are held on the quay front. This day has a much more laid back feel to it, and is an ideal day to be part of the celebrations.